The bestselling wearable activity tracker by Garmin, Vivofit Fitness Band is suitable for everyone looking for a simple and stylish tech companion which tracks their activities and motivates for more! What you read and hear most about Vivofit everywhere is its long battery life which could last up to a year without the need to change the battery. Also it’s water-resistant so you could take it with you to shower as well. Although at the first look, Garmin Vivofit may seem a simple pedometer with plastic band but it’s really more than that. It tracks how many steps you take, how many calories you burn and even calculates the distance you travel. Plus, while going to bed if you set it to the sleep mode, it could also monitor your sleep. And also, it’s obvious that the fitness band shows time as well. The fact that its display hasn’t any backlight may seem a little discouraging at first, but remember that removing this feature alongside other adjusting measures have made it possible for the battery life to be about a year. Everything you need to control with the tracker – such as switching between steps, time, etc. and synching with the app (more on this later) – is done with a single button on the band. You may wonder what the red bar doing on the side of the LCD display. It’s another great feature of the device, an alarming signal for your inactivity during the day. You should at least walk – if not jog or run – unless you want to make the ‘Move Bar’ longer. Otherwise, it grows a bit every 15 minutes you stay motionless. Like many other fitness activity wearables you could set a daily goal for your fitness activities and let the device measure your progress. Garmin Vivofit also allows you to keep track of your heart rate. However, to do so you need to take use of a heart rate monitor which you could buy separately – in case you haven’t bought it with your Vivofit bundle already. The tracker easily syncs with the Garmin app. Just download the right software from Garmin website (Android or iOS app also available) for you device and sign up for an account on Connect with your latest body measurements such as height, weight, and so on. 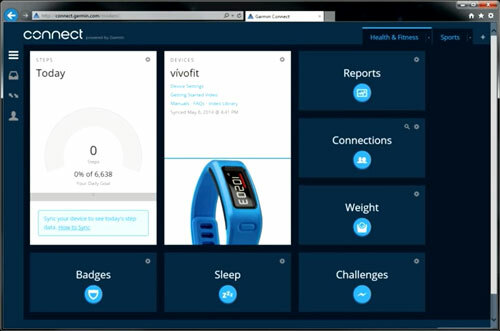 After that you could sync Vivofit to the app through bluetooth. You just need to hold down the button on the band until you see the ‘sync’ word on the display. Next, the gadget will automatically sends the latest activities information to the app. Just bear in mind that the device doesn’t always sync with your tablet or PC, just when you trigger the function with holding the button as mentioned before. Through the app dashboard you could access info about your overall daily activity including steps, calories, and your progress toward your daily goal. Comparing each day activities with past days is very easy in the reports section where you can see your day to day statistics side by side. Enjoy the social features of app by sharing your fitness info with your family and friends in ‘Connections’. You could also participate in challenges with your connections and see who could make it to the ‘Weekly Leaderboard’. Try to earn virtual badges to keep more motivated and on track. Gathering lots of positive reviews from both tech experts and consumers, Garmin Vivofit does a good job of doing its fitness tracking activities and that make it one of the best alternatives to similar fitness bands such as Fitbit Flex. 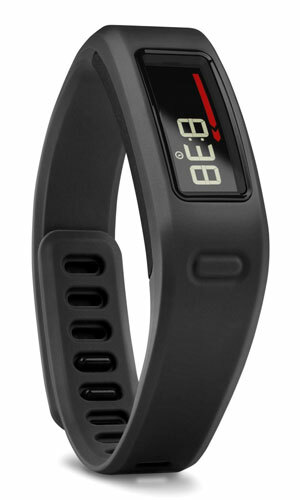 Early this year, Garmin released the version 2 of this band, Vivofit 2 Activity Tracker, with few additional features. With a price of about $85 on Amazon, the least functionality you get with this gadget is a modern looking watch which (hopefully) reminds you to keep up your daily exercise routine.